British Blue genetics have been on winning form at two Harrison & Hetherington venues, firstly, at Kirkby Stephen, at the annual Kirkby Classic Prize Show & Sale. At Borderway Mart, on Monday 18th March, The Border British Blue Club held their annual show and sale of primestock in conjunction with Harrison and Hetherington’s weekly primestock sale. 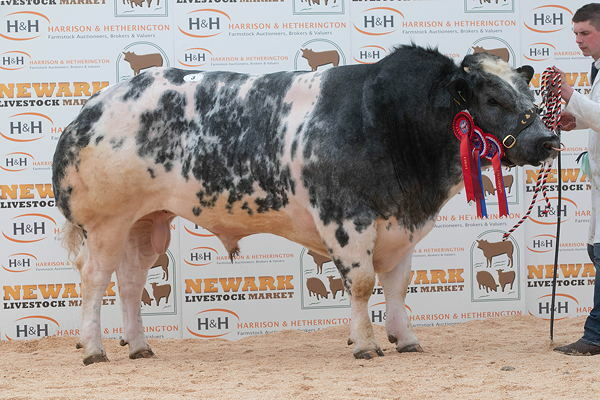 On Saturday 2nd March the sale of British Blue cattle at Beeston held by Wright Marshall on behalf of the British Blue Cattle Society drew an excellent crowd of breeders and show supporters from all over the UK and Ireland. The second highest priced calf and top price British Blue sired calf at the Ruthin Show Potential sale on 23rd February was a Dragonblues Firefly sired steer from JM and AM Lewis, Pwntwyn, Carmarthen. By entering your email address you consent to receive regular updates. No photographs, graphics or images on this website may be reproduced for any purpose without prior permission from the Society. © 2013 - 2019 British Blue Cattle Society. All Rights Reserved.